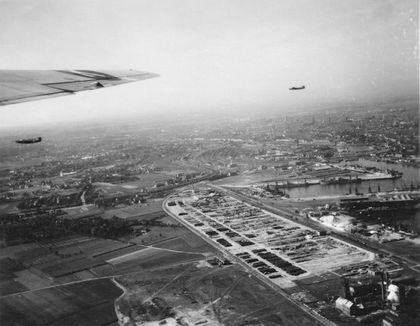 In the beginning of May 1945, with the war in Europe coming to a close, the Eighth Air Force organized the Trolley Missions, involving all bombardment groups. The purpose of these flights was to provide the privilege for all ground (non-rated) personnel, of seeing from the air, their contribution to the strategic air war. 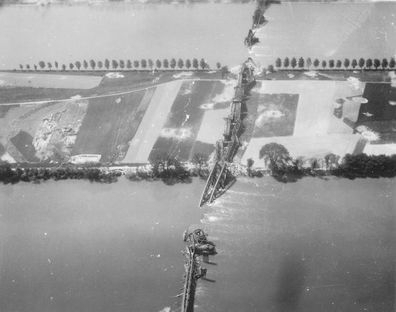 The targets to be visited by air were all assigned and destroyed targets attacked by the group. Each A/C carried ten passengers and five crew members. The whole plan was carried out as if it had been a real operational mission. The squadron operations prepared loading lists on all personnel, both passengers and crews were awakened [and] told to be at the briefing hut at a specified time. An S-2 officer had prepared a complete briefing on the route – having Balopticon slides on all targets – before and after attack, plus the importance of them and the group’s part in their destruction. The 458th flew two separate routes, the first being “The Rhineland Tour”, covering several large cities such as Frankfurt, Mainz, Bingen, Koblenz, Remagen and Cologne among others. 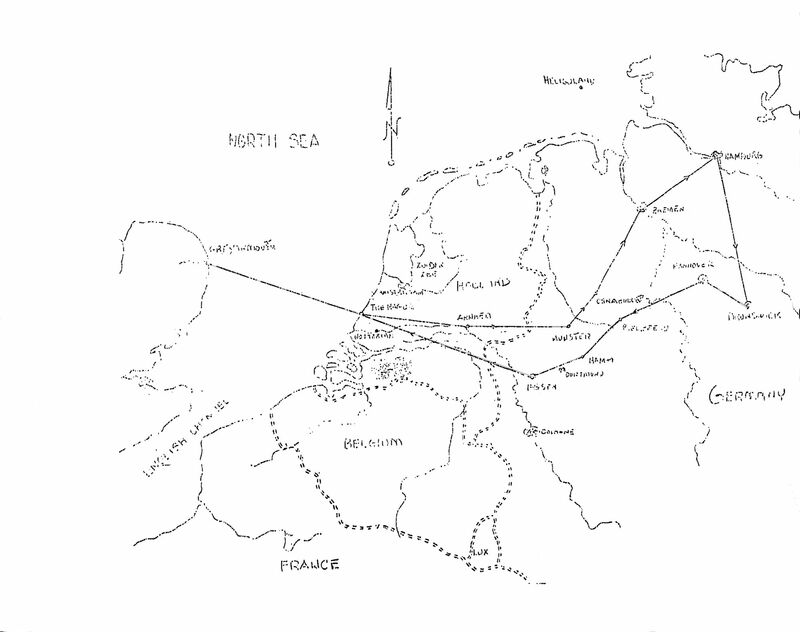 The second route, labeled “Northwestern Germany”, overflew parts of the Ruhr with industrial cities like Munster, Osnabruck, Bremen, Hamburg, Brunswick, Hamm and Essen, etc. Statistics from the 96th Combat Bombardment Wing show that the 458th flew 105 sorties, carrying 892 men from Horsham St Faith, 81 from Debden, and 74 men from Little Waldon. These flights were performed over the six day period of May 7 – 12. 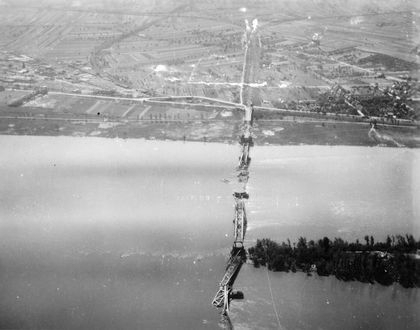 No accidents occurred with the group’s Liberators, although one B-24 from the 389th BG flew into a bridge over the Rhine near Cologne killing 19 men. 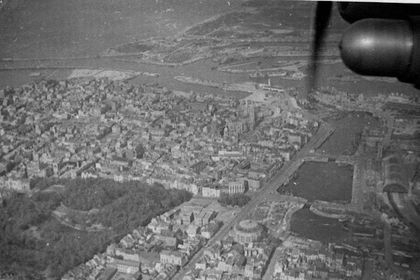 The photos below show several cities and sites that the men overflew. Most of these photos are from three sources. The first grouping comes from John Zimitsch, son-in-law of Lt Merrill L. Holtz, a pilot in the 754th Squadron. Their crew arrived in mid-February and completed 13 missions prior to war’s end. The second set of photos comes from Arie Church, the grandson of Lt Hubert M. Church, the co-pilot on the crew of Lt William V. Sanders. They were assigned to the 753rd Squadron, also in mid-February 1945, and had flown 14 combat missions before the war was over. The final group of photos comes from the family of Sgt James A. Harper, a gunner on the crew of Lt Charles S. Brown. They arrived at Horsham a few days after the Sanders’ crew and were assigned to the 752nd Squadron. They flew 12 combat missions. 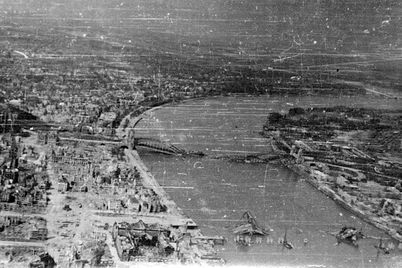 The locations of several cities in the photos have been identified, but most of them have not. 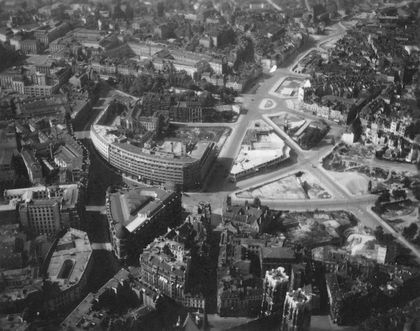 Jurgen Einrauch has identified the city of Essen from Merrill Holtz’ photos and sent along a picture of the same area as it appeared in 1930 and a Google image as of 2014. Thanks to the remarkable efforts of John James (great-nephew of James Harper), a number of these cities have been identified. He has used Google maps and rendered 3D images of the same area as it appears today. In addition to the Trolley missions, the 458th BG (among others) allowed those men who had earned the Bronze Star the opportunity to visit Koblenz. 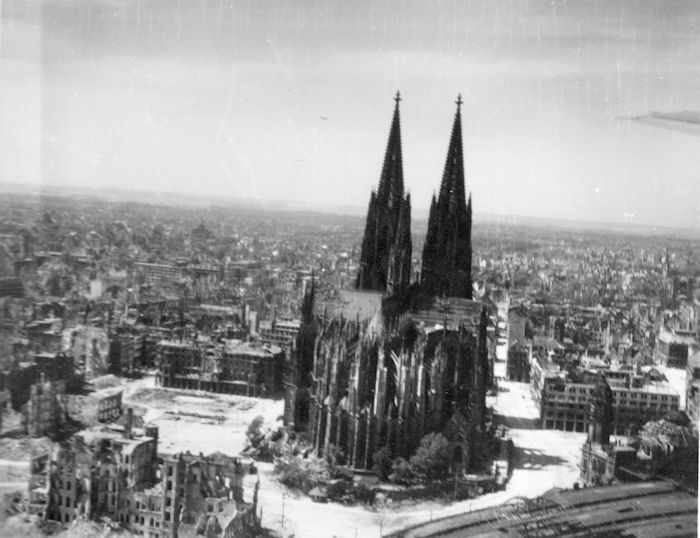 Unlike the Trolley missions, where the aircraft were not allowed to land on the Continent, those who participated in the "Bronze Star Tour" were allowed to tour the city on foot for three hours. At the bottom of this page are a number of photographs where the location has not been identified. If you can identify any of them, please contact me. 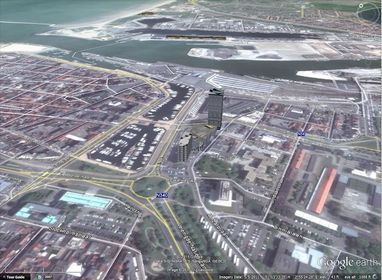 OSTEND - You will make continental landfall at this fashionable Belgian sea-side resort whose harbor has recently been dredged to make it an important Allied Supply port. 30 miles to the right is Dunkirk. GHENT - This textile, linen and lace manufacturing center will be just to your left. 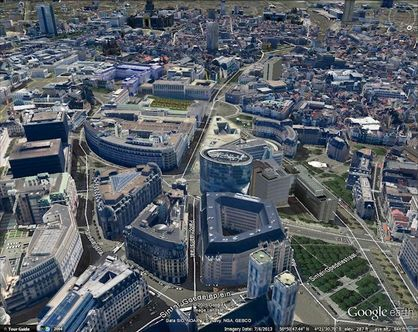 BRUSSELS - (Pop. 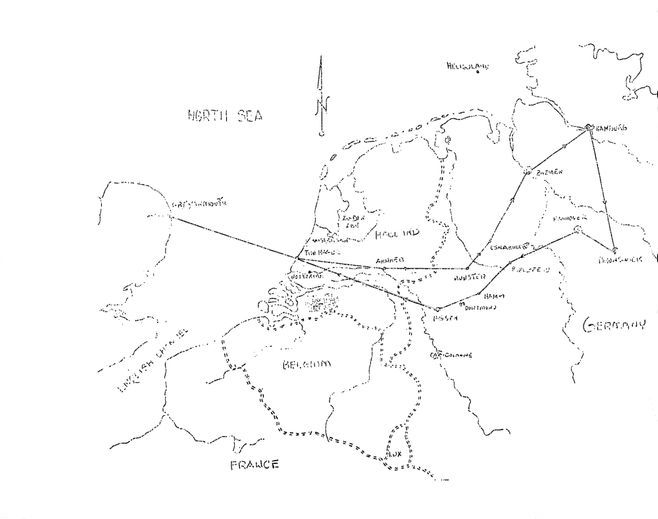 912,000) - Just to your left will be the capital of Belgium. 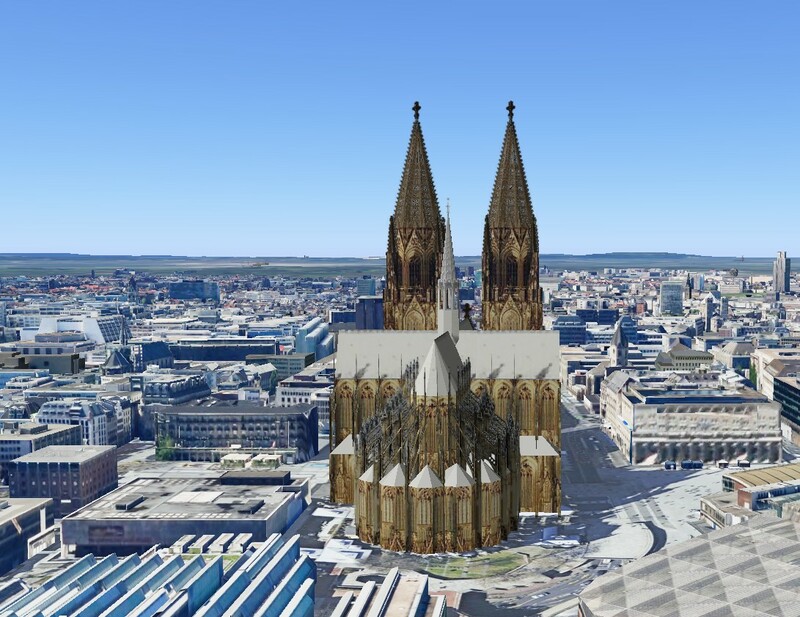 In the center of the city you will see the Royal Palace and Cathedral. 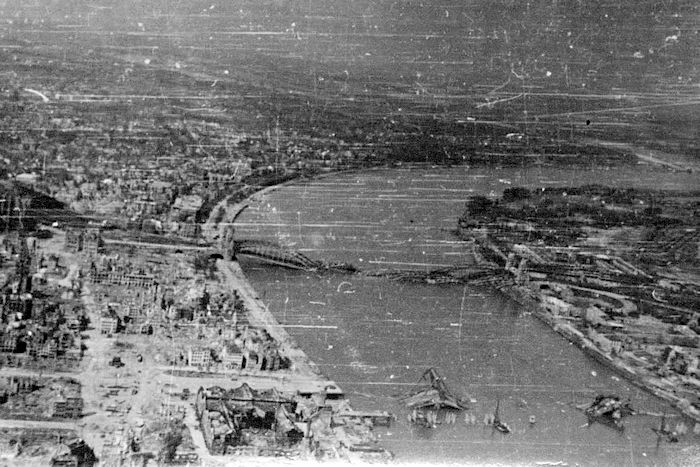 Damage from V-bombs may be apparent. NAMUR - 10 miles to the right of course, at the juncture of the Meuse and Sambre rivers, is this city of strategic importance on the traditional route of invading armies. 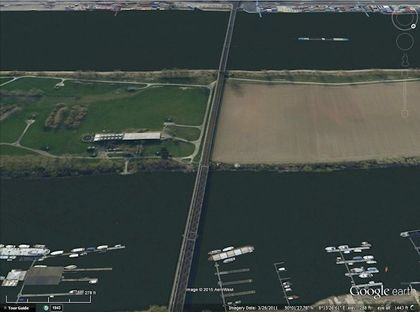 It is surrounded by old forts. The Citadel stands on a hill between the rivers on the site of a Roman fort. ST. VITH - Five miles to left of course [this town] was an important point in the great Ardennes battle of the past winter. You may be able to see the Siegfried line when you cross it in this vicinity. 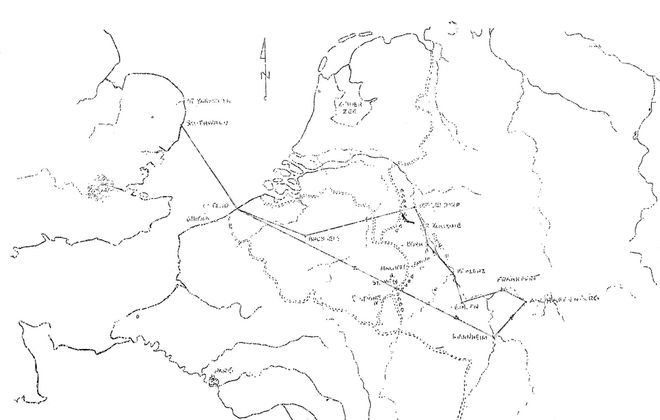 Bastogne is 15 miles to right of course. PRONSFELD - You pass directly over this rail and road junction which was of tactical importance during the Ardennes battle. SCHONECKEN - Five miles beyond Pronsfeld just to your left will be this small but important junction town, also a target during the Ardennes campaign. 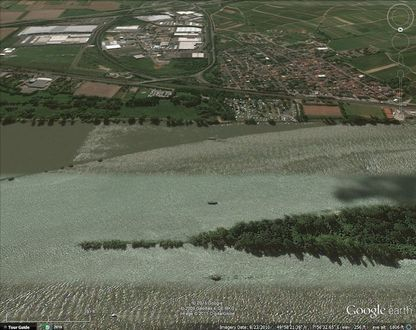 MOSELLE RIVER - The winding characteristics of this stream will help you identify it. KAISERSLAUTERN - 15 miles to the right will be this great railway center with its long marshaling yards, railway shops, storage depots, and engineering works. WORMS - 10 miles to the left of course lies this leather manufacturing city, one of Germany's most ancient and at one time most important towns. It was the residence of Charlemagne and the Franciscan kings. 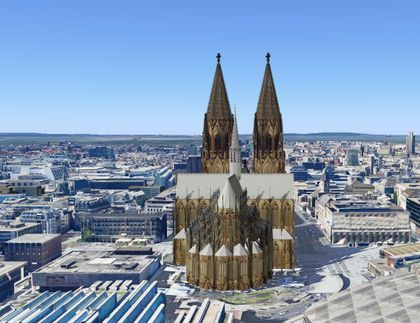 It was the scene of the famed Imperial Diet of 1529 at which Luther defended his doctrines before Emperor Charles V. It was laid waste in the 30 Years War and is again in ruins as a result of bombing. 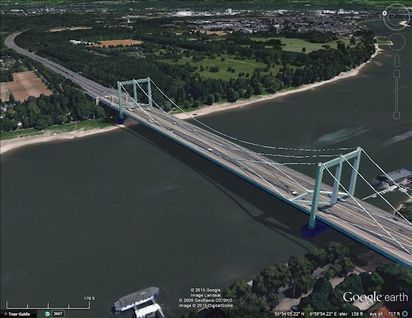 MANNHEIM-LUDWIGSHAFEN - (Pop. 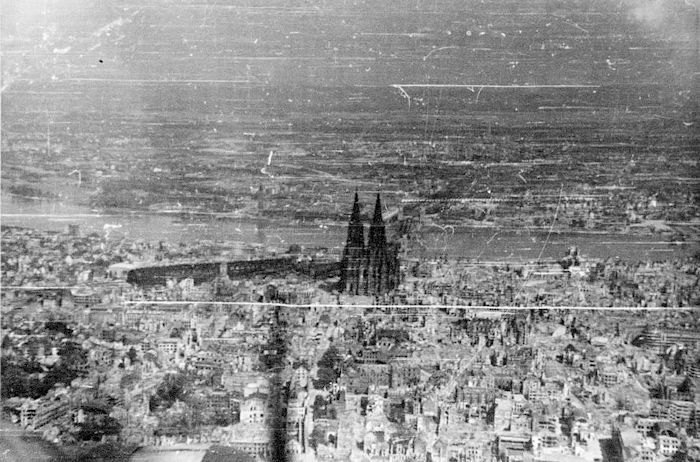 580,000) - These twin cities, on the east and west banks of the Rhine respectively, formed one of Germany's great industrial centers. 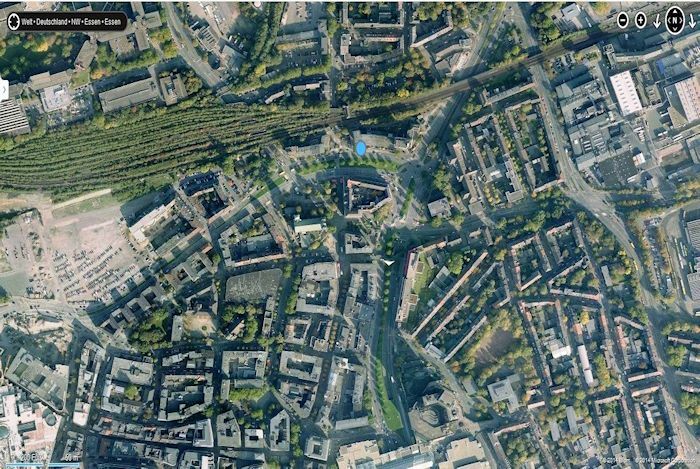 Mannheim is the most regularly designed city in Germany [sic]. These cities contain the second largest marshaling yard in Germany, a plant which produced 60% of Europe's aluminum, and just north of Ludwigshafen [is] the I.G. Farbenindustrie, [the] largest chemical works in Germany. Also here were Daimler-Benz and other engineering works, including electrical engineering works and vast power generating facilities. This is the main trans-shipment center of the upper Rhine. HEIDELBURG - 10 miles to the right up the Neckar River is this famed university town, whose school, founded in 1386, is known as the "cradle of science" in Germany. A castle ruin there is reputed [to be] the most significant in Germany. ASCHAFFENBURG - A four towered castle landmarks this inland port which contained a marshaling yard, transformer station, tank depot, and manufactured tools and paper products from the extensive forests nearby. HANAU - Five miles to right of course, this town contained a marshaling yard, the Dunlop rubber works, second largest tire factory in Europe, ordnance depot, nickel and alloy mills, and artisans, working in precious metals and diamonds. FRANKFURT-ON-MAIN - (Pop. 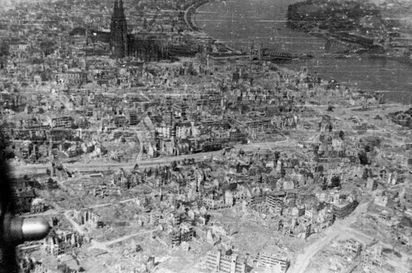 570,000) Here you fly over the ruins of one of the Reich's most prosperous commercial and industrial cities, founded before 793. In the vicinity are watch towers. Last of the emperors of Germany were chosen here and it was a famous art center. 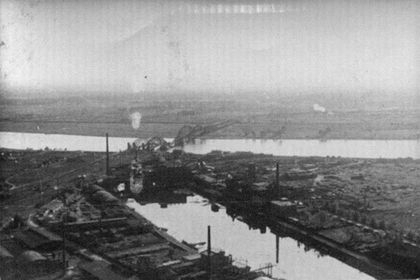 Industrially it contained extensive rail facilities, aircraft component factories, metallurgical works, engineering construction, ordnance depots and oil storage facilities. 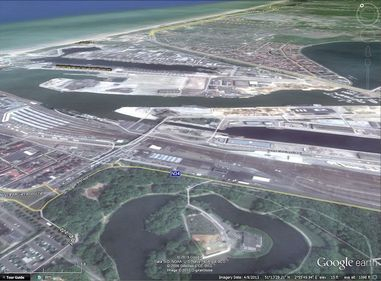 This inland port was at once the cultural metropolis of the upper Rhine, a great military training center, and an industrial stronghold. WEISBADEN - (Pop. 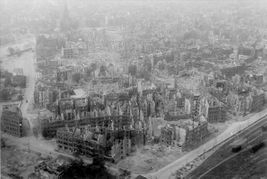 158,000) - Just to right you will see this city whose industries consisted of chemical works, engineering, and ordnance depots. Additionally it was a favorite health resort. 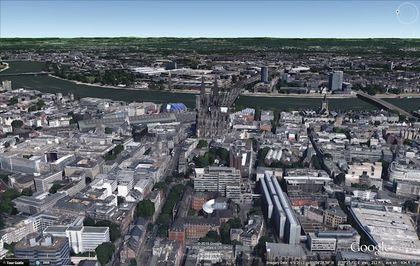 MAINZ - On the left, opposite the junction of the Main and Rhine Rivers, lies this inland port, first established by the Romans in 14 B.C. Since 1792 it has been alternately under French and German rule. 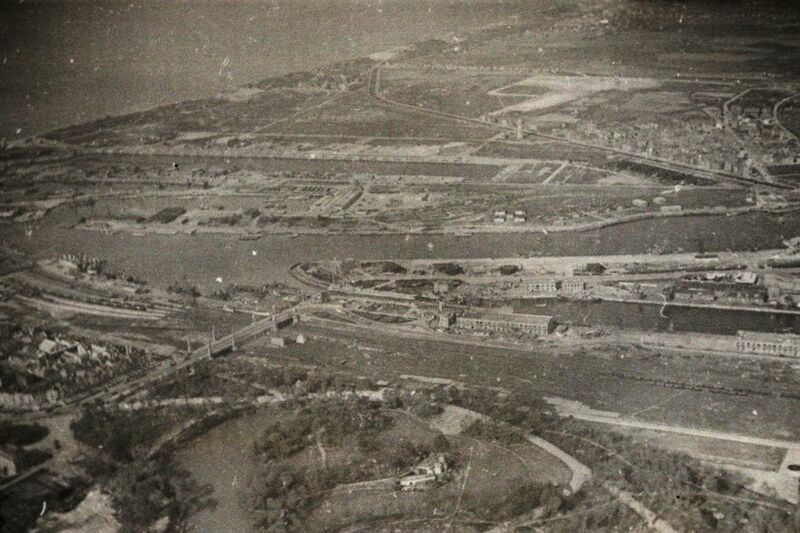 An ordnance depot is nearby and it is a railway and river traffic center. 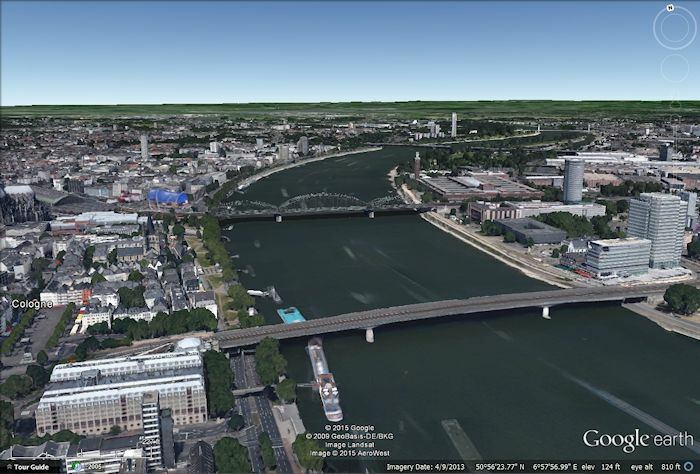 It also is the center of the Rhine wine and German champagne industry. BINGEN - At the great bend of the Rhine where it is joined by the Nahe River, this small community contains an important rail center and oil storage. It was the scene of a battle between the Romans and the Gauls in 70 A.D. Klopp Castle rises above the town on the site of a Roman fortress. To the north across the Rhine lies Rüdesheim, producer of the most famous and costly wines in the world. 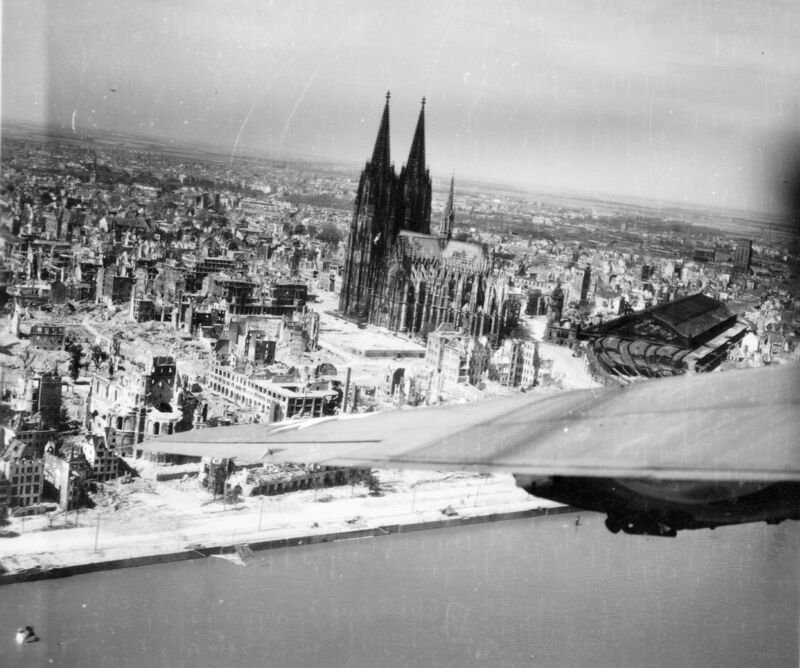 The bridge connecting these towns was bombed by this Wing. You will see on the north bank at the bend of the Rhine, Neiderwald Mountain, atop which is located the German national Monument, constructed to mark the birth of the German Empire in 1870 and symbolizing "The Watch on the Rhine". 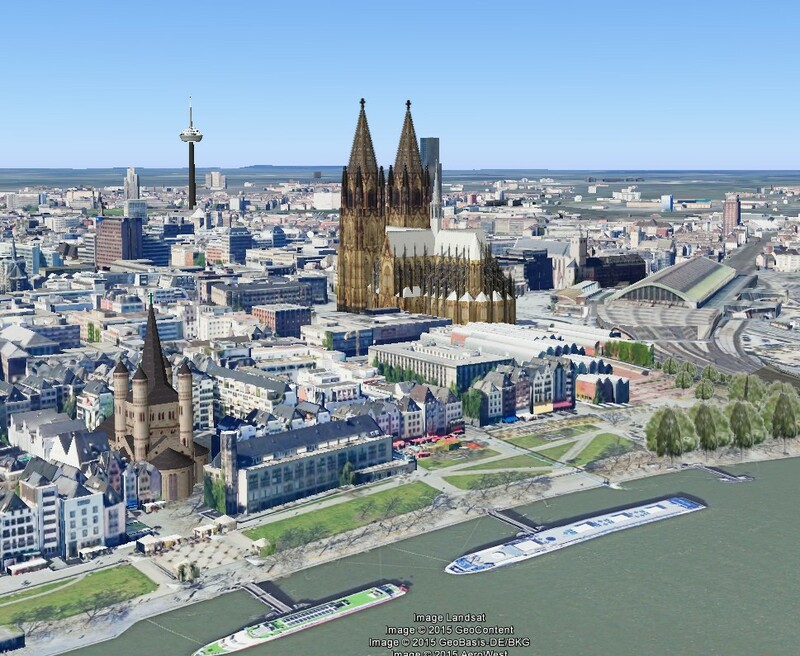 From here, as you continue north along the Rhine, you will see many famed castles along the steep banks. KOBLENZ - (Pop 86,000) - At the confluence of the Moselle and Rhine rivers is the important transport center whose many bridges have provided targets in addition to its rail yards. 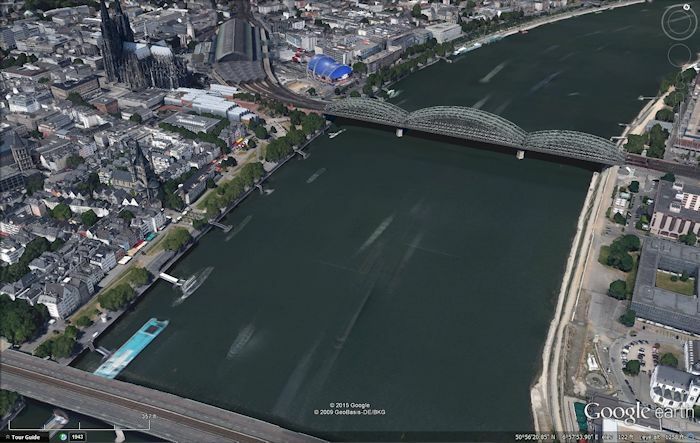 At various times it has been occupied by France and Germany. Opposite on the east bank of the Rhine is the majestic fortress of Ehrenbreitstein above which General Bradley's armies recently hoisted the Stars & Stripes for the second time this century. It was occupied by Americans after the last war. NEUWEID - Ten miles from Koblenz on the east bank you will pass the Neuwid Bridge across a small stream entering the Rhine. 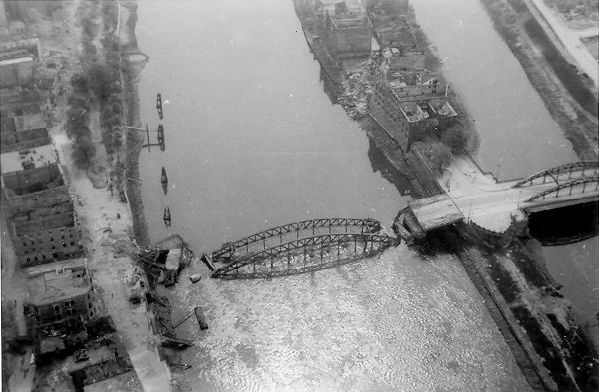 REMAGEN - 20 miles north of Koblenz is the wreckage of the bridge which will live in history. 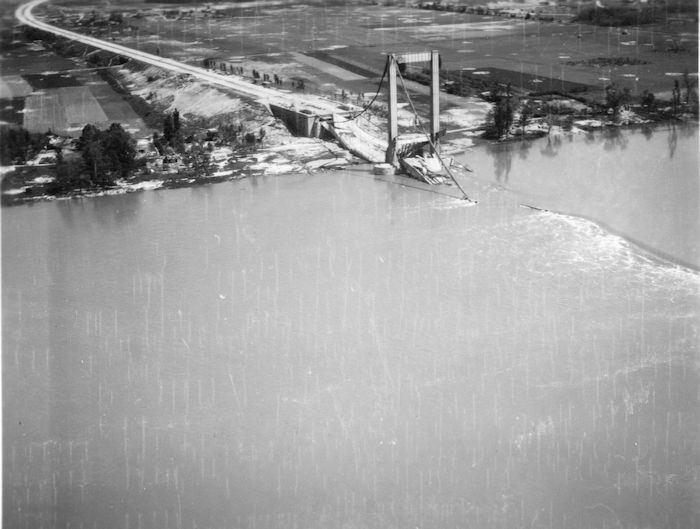 Across this Ludendorf Bridge rolled the first allied troops to penetrate beyond the Rhine and before it collapsed thousands upon thousands of dough-boys had penetrated beyond and secured an entrance into Fortress Germany. 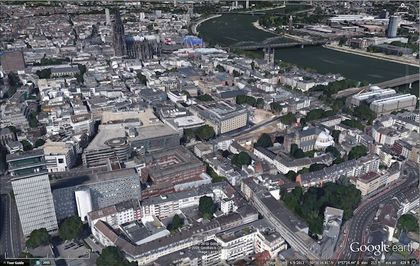 BONN - On the west bank of the river, this is the seat of a large university and the site of one of the first Roman forts on the Rhine. It was the home of Beethoven. KOLN (COLOGNE) (Pop. 912,000) - Here you see the rubble which was Germany's third city. 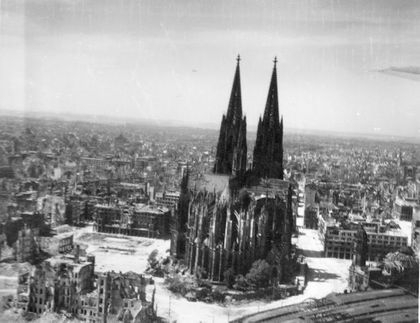 The Cathedral a magnificent Gothic artifice, stands out amid ruins, only slightly damaged by the avalanche of bombs which flattened the great industrial metropolis. 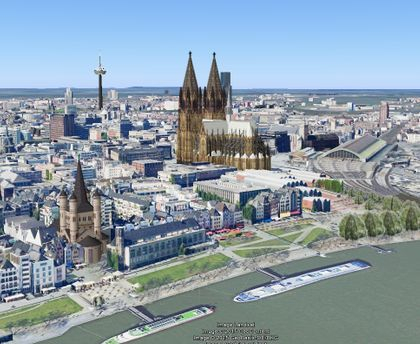 Koln was founded in 36 B.C. 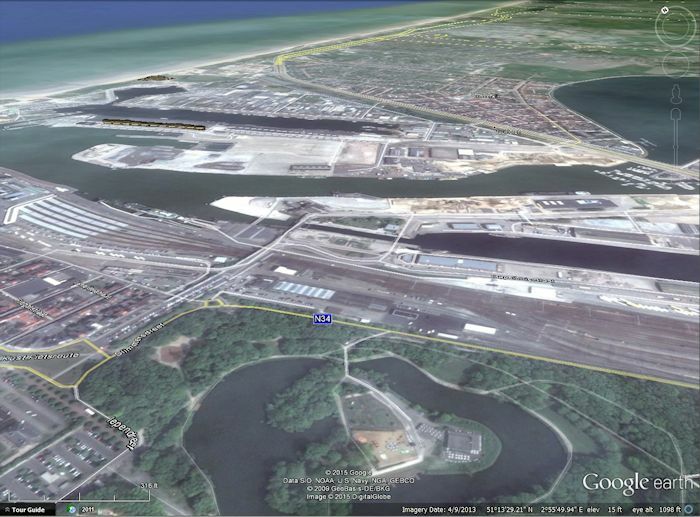 Its many marshaling yards at one time could handle 16,000 cars a day. 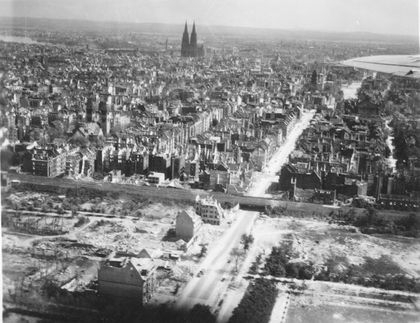 Motor works, machine manufacture, chemicals, textiles, and luxury goods at a time made this the center of trade, traffic, and political activity in the Rhineland. 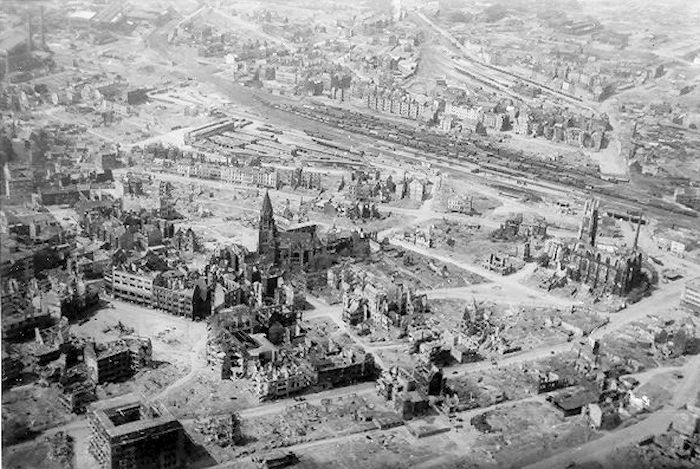 MONHEIM - 10 miles north of Koln, on the east bank of the river is an oil refinery, bombed out of production. DUSSELDORF - (Pop. 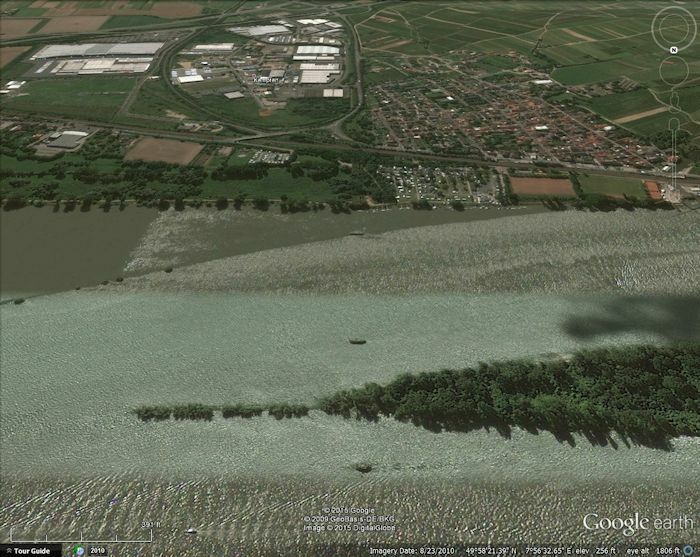 559,000) - At the southwest corner of the Ruhr. A railway center, with steel and armament works, engineering and machine tools, a motor transport depot, it was once rated the leading commercial city of Western Germany. To your right as you turn you will see the great cities of the Ruhr, most highly industrialized area in Europe. 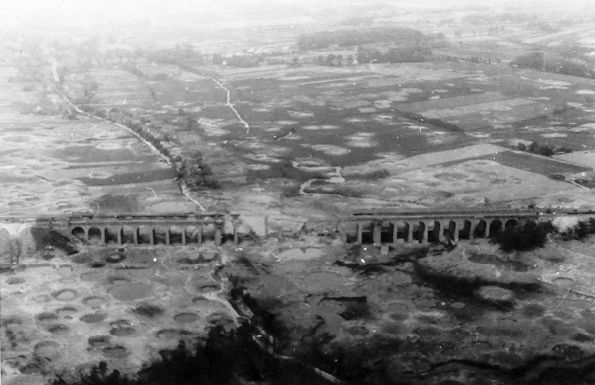 To protect this empire, the Germans erected a wall of anti-aircraft fire unequaled anywhere, giving it the nickname among allied fliers of "Happy Valley." MONCHENGLADBACH - 10 miles beyond Dusseldorf, is this city of railway facilities, textile mills, and engineering works. On the outskirts is a large airfield. ROER RIVER - 30 miles past Gladbach you will cross the Siegfried line again and the Roer River, scene of some of the bitterest fighting of this war. 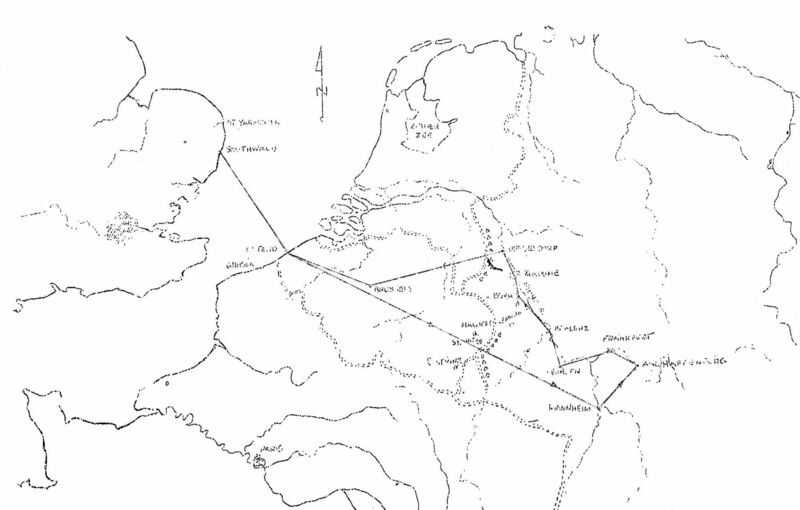 Then the line of flight takes you to Brussels, Ostend, and back to base. KATWIJK AAN ZEE-- Small town of about 6,000 inhabitants and in peace time was a popular Dutch watering place. About 1/2 miles North of town is the mouth of a canal closed with huge gates, which assists the Old Rhine River to empty into the Sea. LEIDEN - Just to right of course is one of the most ancient towns in Holland, population about 53,000. Here a famous old University, donated in 1575 by William of Orange is located. Leiden also is the birthplace of many famous Dutch painters, including the great Rembrandt Van Ryn. UTRECHT - Capital of Dutch province of the same name with 100,000 inhabitants; and is another very ancient town, being early celebrated for the beauty of its churches and as an educational center. Ramparts which in early days surrounded the town have been converted into pleasant promenades, everywhere bounded by flowing water. 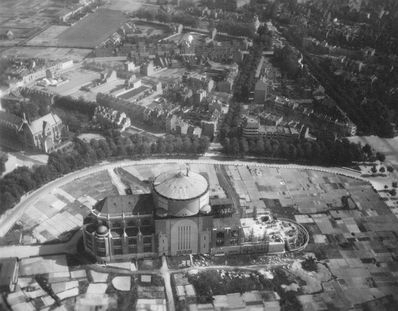 ARNHEM - One of Hollands most attractive towns, and is a favorite residence of Dutch "Wabobs" from the East Indies. It was here that the English paratroopers fought so valiantly until compelled to retire before superior numbers. 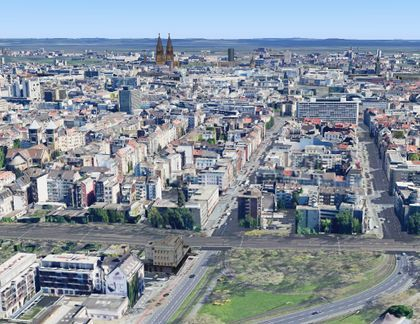 MUNSTER - Chief town and administrative center of Westphalia and an important railway junction. 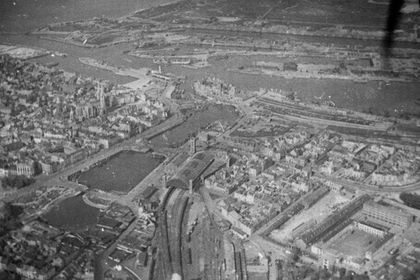 Dortmund-Ems Canal passes through town running North and South, and north of town was carried over Ems River by large aqueduct before the RAF bombed it out. Its railway transportation system as a pet target of the 8th AF and was defended by intense and accurate flak. OSNABRUCK - Vital railway junction on main railway line from Berlin through Hannover to Holland, and here crossed by another main line from Ruhr to Bremen and Hamburg. 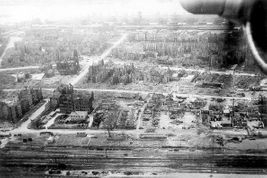 Of major importance were the iron and steel rolling mills located just South of the city, and also large cotton spinning and weaving mills, attacked many times by 8th AF. 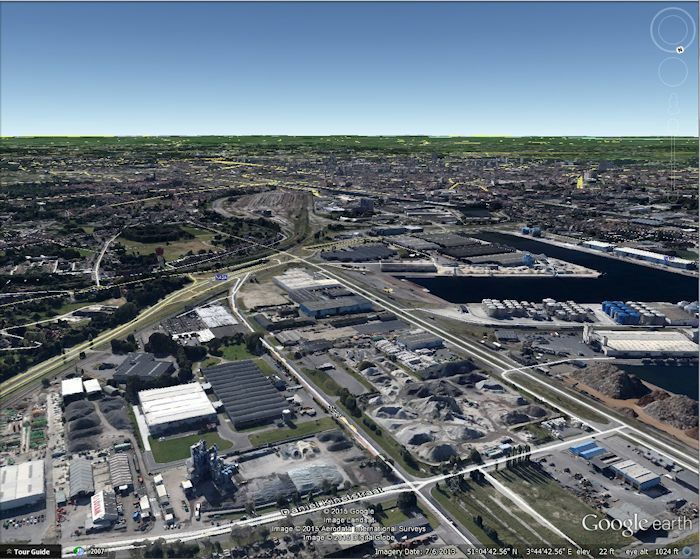 EMS-WESER CANAL - Important East and West waterway. DUMMER LAKE - Main point of interception of bomber formations by Luftwaffe fighters and scene of many terrific aerial battles. BREMEN - (Pop. 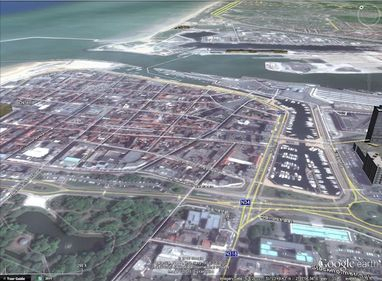 383,000) Second largest port in Germany, and lies on both banks of Weser River, its most important industries are shipbuilding, oil refineries, textiles, and aircraft engines. HAMBURG - (Pop. 1,700,000) For a long time has been held first place among ports of Continental Europe and rose to be [the] third largest centre in [the] world. 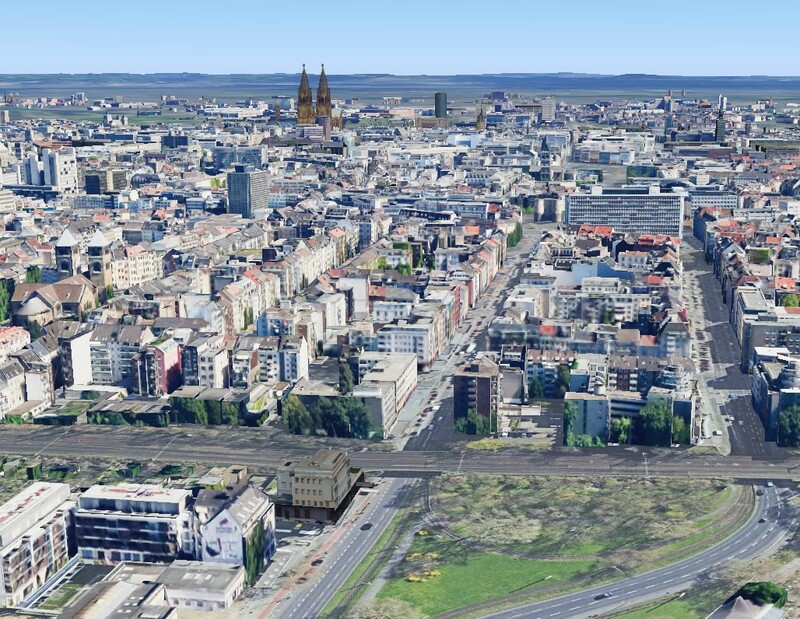 Metropolitan area includes Hamburg and Altona, both being important industrial areas. Chief industries are shipbuilding, synthetic oil, aircraft engines, armament works, chemicals and explosives, rubber and tires and foodstuffs. 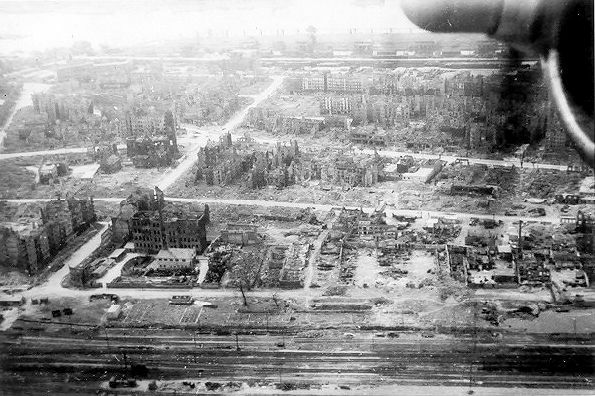 Entire built up area was well defended by flak. LUNEBURG - A few miles to left of course. Formerly a large supplier of salt and more recently a health resort visited largely for its brine baths. BRUNSWICK - Chief town of the State of Brunswick. 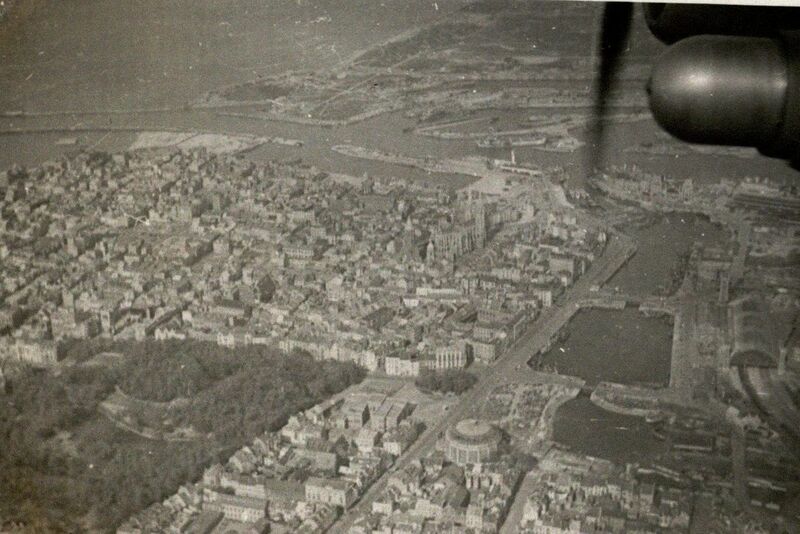 During war this town became of outstanding importance owing to development of aircraft and engineering industries. 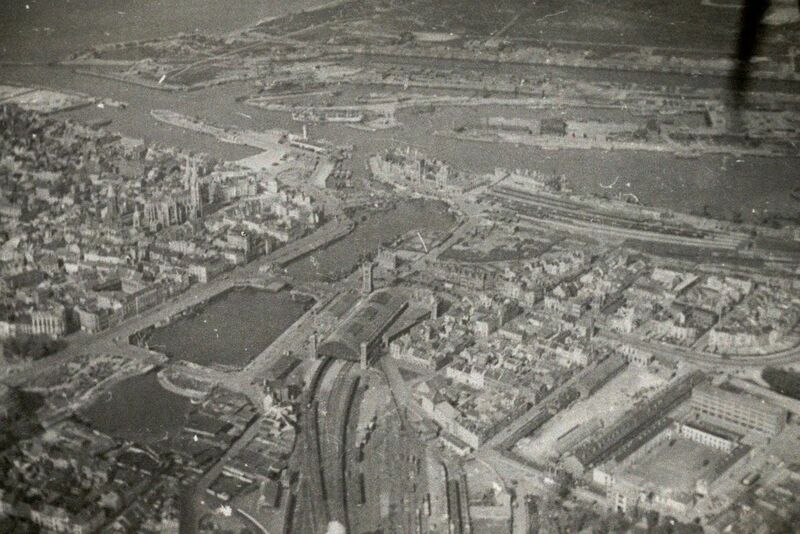 Industrial plans mainly grouped in Southern quarter of town. A few miles south of the city is the huge Herman Goring Steel Plant. HANNOVER - (Pop. 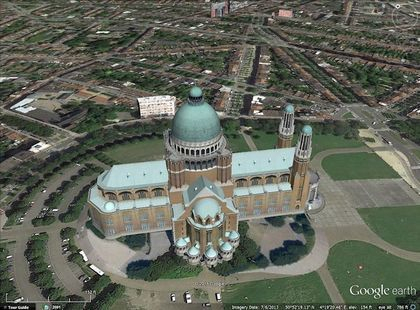 450,000) Highly industrialized and is one of the chief commercial and administrative centers of Northern Germany. Main industries are engineering, rubber tires, and armament; its rubber company supplied 80% of Germany's aero tire requirements. Misburg, an outlying suburb three miles to East of city was an important oil refinery, built on edge of an extensive oil field. BIELEFELD - (Pop. 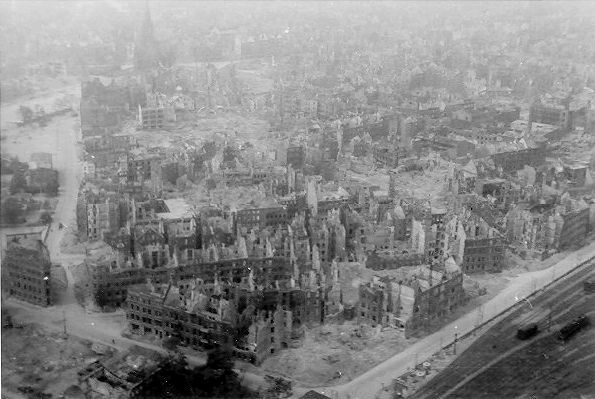 125,000) On main railway line from Berlin through Hannover to Hamm. Besides being the center of the line trade, it contains several engineering works which in peacetime specialized largely in manufacture of cycle and sewing machines. 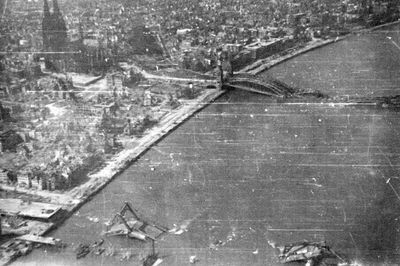 Town is best known to 8th AF as being near the famous viaduct which withstood so many attacks, finally succumbing to the 10 ton bombs of the RAF. 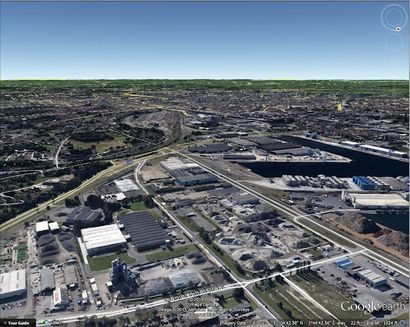 HAMM - One of the most vital centers for railway traffic to the Ruhr. 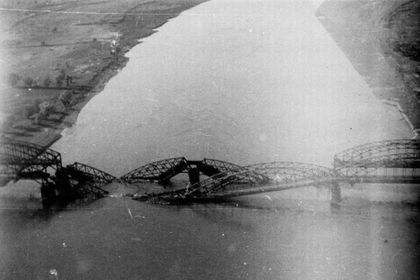 The Stationmaster at Hamm has had much written about him during the war, it was [for] him that each RAF aircraft always saved one bomb. The M/Y there had a capacity of 10,000 wagons a day and is the largest in Germany dealing with general traffic. DORTMUND - (Pop. 640,000) Largest and most easterly town in the Ruhr, and is the principal transport center. Aside from its transportation system it is noted for its solid fuels, iron and steel works, foodstuffs, armaments, chemical and explosives. 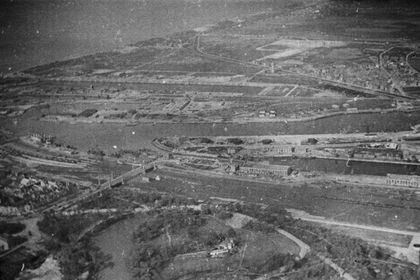 Considered as part of "Happy Valley", the name given for that heavily flak defended area. ESSEN - (Pop. 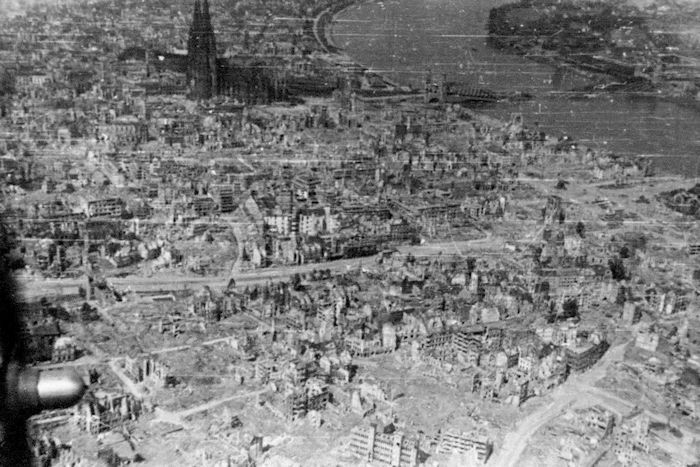 1,139,000) Great armaments center of Ruhr. It was here that the main plant of the Friedrich Krupp works were located. If you can identify any of these locations, please contact me.